DENVER (AP) — Santa already is piling up big numbers on social networking sites this season, so the volunteer Santa-trackers at NORAD are bracing for tens of thousands of calls and emails when their operations center goes live on Christmas Eve. "We expect our numbers to be very high this year," said Joyce Creech, project leader for NORAD Tracks Santa at Peterson Air Force Base in Colorado Springs, Colo.
Last year, NORAD Tracks Santa volunteers answered 80,000 phone calls on Christmas Eve, Creech said. They also answered 7,000 emails. The North American Aerospace Defense Command has been telling anxious children about Santa's whereabouts every year since 1955. That was the year a Colorado Springs newspaper ad invited kids to call Santa on a hotline, but the number had a typo, and dozens of kids wound up talking to the Continental Aerospace Defense Command, NORAD's predecessor. The officers on duty played along and began sharing reports on Santa's progress. It's now a deep-rooted tradition at NORAD, a joint U.S.-Canada command that monitors the North American skies and seas from a control center at Peterson. NORAD's Santa updates are just about everywhere — on Facebook, Twitter, YouTube, www.noradsanta.org and television. And this year, there's a new Santa-tracking app for smart phone s, built by visionbox, a Colorado Springs software developer. It has the Elf Toss, a game similar to Angry Birds. The app was downloaded more than 234,000 times from Android Market and iTunes App Store by mid-December, Creech said. NORAD Tracks Santa already has had more than 754,000 "likes" on Facebook this year, compared with 716,000 through Christmas Eve last year. Twitter numbers also are up, with 60,000 followers so far this year, up from 54,000 last season. The NORAD Tracks Santa website has had more than 2.2 million unique visitors this year, compared with 2 million last year. The rows of telephones in the operations center are still the heart of the operation. More than 1,200 volunteers answer calls in shifts, checking big-screen computer monitors indicating Santa's location and passing that along to children, many who seem dumbstruck. "It's just so precious to hear the little sigh or (only) breathing on the other end, and you realize how nervous they are," Creech said. "But we've had really heart-wrenching stories as well," she said. "'Can you ask Santa to heal my brother of cancer?' Or, 'Can I get a new pair of shoes? I don't have any.'" Calls like that make the volunteers feel fortunate to have what they do, she said. 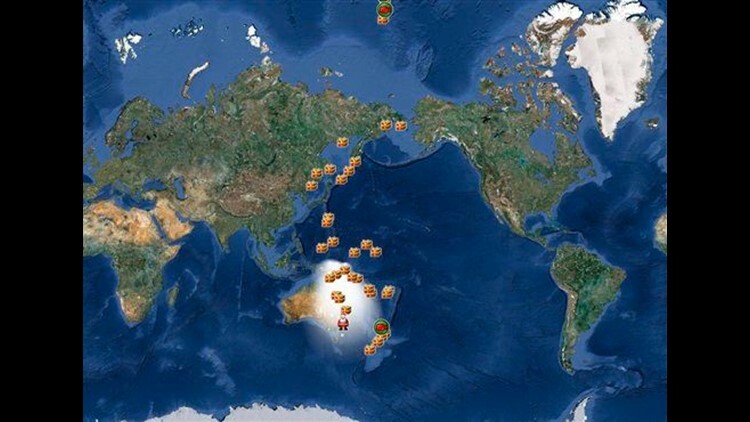 NORAD Tracks Santa has added 20 phones this year, bringing the total to 120, and four more laptops, for a total of 23. The phones will be answered from 4 a.m. Mountain Time on Christmas Eve until 3 a.m. Christmas Day. Creech said the rising numbers are probably a reflection of how much people look forward to the season, and how much of a tradition calling NORAD has become for many families. "You can tell that it really brings people joy, and especially kids," she said. YouTube is owned by Google Inc.; iTunes is owned by Apple Inc.